I said would send a write up on The Boston Marathon last week. Clearly I didn’t and even that would have been a bit late. This e-mail is longer than usual but it needs to be to tell the story. Hopefully it’s interesting. Here is how things unfolded. We had awesome spring days leading up to the race and my loosening run the day before felt good. I felt I was ready to give my target time of 2hrs 55mins a crack. I found it hard to believe the weather forecast which predicted 7 degrees centigrade, rain and wind for the race. Please let the weather hold out. The normal way to get to the start and the way most people do it is to catch the official Boston Marathon buses from Boston from 6:00Am to the athletes village about 1.2km from the start in Hopkinton 42km away. You’d then have to wait about 2.5 hours in the athletes village until 9:15Am when my group would be asked to leave the athletes village and head to the start line for 10:00Am. Keep in mind the athletes village is simply a bunch of large tents/awnings with no chairs. A 2.5 hour wait in those conditions with that cold would be horrible. Another official alternative would be to catch a Boston Marathon Shuttle from about 2km outside to the athletes village from 6:30Am onwards. My girlfriend and I rented a car and drove all the back routes until we knew the best way to get as close to the athletes village as possible as we thought maybe it was best she drives me. There were a bunch of road closures and our planning had to be good so that we could make it as hassle free as possible. This way I would be in control of my time. The night before I decided to catch the 6:45Am shuttle the hotel provides that would supposedly take us closer to the athletes village than we could do in our own car. At about 6:15Am race day I was chatting to another runner (Boyd) starting in the same group as me who had done 10 Boston Marathons. He was going to catch the 8:30Am shuttle as apparently the year before it made it through road closures all the way to the athletes village. Now this would be cutting it tight but this way we’d have very little time to wait before the start. As he is a veteran of this race I decided to do the same. On the shuttle I quickly realised the driver wasn’t taking any back routes which worried me as I knew there were road closures. It was even more puzzling when the other runners questioned him and found he had lived in the area his whole life. He didn’t have a clue about road closures and the police flat out refused him entry even though he protested he had runners on board. At about 9:20Am myself and Boyd climbed out the shuttle (the other runners were in later start groups so they stayed) as we were getting further and further from the athletes village and the start. We had to walk about 3km from there to get to the start and skipped the athletes village. Eventually I was in my start group waiting for the gun with about 10 minutes to spare…all good. The day had turned out to be the 7 degrees promised and it was predicted to stay that temperature…I think it got colder. At the start I ditched a bunch of my warm clothes. They had people holding bags for charity collection…we keep warm until the start and less fortunate get clothes, everyone wins. 10:00Am and the gun went off and no movement…that’s what happens with 5 000 runners in front of you. It took about 3mins 30s to cross the start. After about 8kms the rain started and while it seemed it wouldn’t last it did. At 15km though I was bang on my race plan so all good. Given the conditions I adjusted my finish time to a more realistic 2hrs 58mins. At 21km I was on track for my adjusted time but the conditions were getting worse. To go with the cold and ever harder rain there was a headwind. Heartbreak hill finished at about 32km and it was tough. I looked at my watch and thought I was still on track for 2hrs 58mins. While mostly flat the last 10km was really tough. The rain didn’t stop, the wind seemed to pick up and the cold felt worse. It was difficult to get my muscles moving and I simply couldn’t do the fast finish I had planned. I finished just after 1:00Pm in 3hrs 1min and while disappointed with my time was happy to be done. It took about 1 hour until I met my girlfriend and was able to put on some warm clothes. I don’t remember ever being as cold as during that wait. My muscles tightened up so much because of the cold I could barely walk. It was miserable enough that medics were pushing wheel chairs around and taking runners to the medical tent to warm them up. To make the experience more memorable our apartment wasn’t ready until 6:00Pm that night so it was a long wait until a hot shower. Thinking back to the conditions I’m actually reasonably happy with my time. The atmosphere was amazing though. There were people lining the route from start to finish, absolutely unbelievable and something I’ve never experienced anywhere else. Would have enjoyed it more in better conditions. Why do we run, cycle or do endurance sport? Paul and I were discussing this a few days ago and it’s difficult to give a good answer to someone who has never done an endurance event. My story above sounds as appealing as ripping your eye out with a spoon but for some reason it was a good experience. Yes you can be hurting, your muscles burning and your lungs busting but there is some perverse pleasure in that. For sure you’ll never enjoy a hot drink and shower as much as after an experience like I described above. Paul and I recently read a very interesting article about whether a high fat diet is better than a high carb diet. It’s a very balanced and sensible view and while the article is aimed at endurance athletes, anyone trying to maintain a healthy lifestyle would probably find it interesting. Click ‘here’ to read it. Later in the week I’ll let you all know how my Boston Marathon run was. Paul and I eat a lot of Coconut oil and use it for cooking. As oils go you’ll battle to beat it for taste and for health. Don’t take our word for it, do some research. One of the huge positives for Coconut oil is how it improves your good cholesterol…in today’s world that has to be a good thing. Anyway, recently there has been talk of MCT oil being better than Coconut oil…we think not but we may be biased. Paul found an interesting article about this subject which is included below. How well does Sportfasting work? Well, when an elite athlete can drop 4 kg’s in a week whilst still keeping his strength and improving his endurance, the proof is in the proverbial pudding (we know Sportfasters aren’t allowed pudding!). Check out Neville Bradshaw’s (professional Motocross rider in Europe) before and after. Due to increasing shipping costs and an unfavourable exchange rate, it has finally come to that time where we need to increase the pricing structure on our products. As of the 1st of May 2015 the price for the 10 day ‘Make the Switch’ program will be R3 395 and the 3 day Mini Fast ‘Keep the Switch’ will be R995. We still have some of the old priced supplements in stock so to give all our existing customers an opportunity to take advantage of this, any orders placed before 1st May will be at the old price of R2 795 for ‘Make the Switch’ and R780 for ‘Keep the Switch’. If you have been debating whether or not to embark on another ‘Make the Switch’ program or simply top up your body’s new metabolism with a ‘Keep the Switch’, this might be just the nudge you need to go ahead and commit!I mentioned in the e-mail on 12 December 2014 that I was doing The Boston Marathon on 20 April. It’s now 10 weeks away and I’m looking forward to it. Aside from being sick for 4 days last week preparation has been good. So far I’ve been hitting my target times in 21km practice races and am feeling strong.Congratulations to Malcolm Barske & Rassie Smit on their results at The 2015 South African Cycle Champs. We are proud to have been part of their preparations! Sitting at the airport waiting for my flight and I’m wondering how to train until next year. Paul and I have spent the past 10 days indulging more than normal. We don’t indulge much so almost any indulging for us is more than normal. Let’s call the past 10 days in Gordons Bay a retreat. Paul ran a bit and I cycled a bit. Foreign disciplines for each of us, but good to do. We ran and cycled when we wanted, without any routine. Some days our training was short and some days we didn’t train at all. You may think this seems a little odd, cut back the exercise and indulge at the same time. Surely that’s a recipe for losing your hard earned fitness and putting on some weight. It may feel that way but it’s also a recipe to refresh your body and your mind. No-one can maintain Peak Fitness the whole year round. In fact,this isn’t the first time this year I’ve had a break but this one is definitely the biggest of the year. And I’m not going to feel guilty about it. It’s part of my program and as important as the hard training I do the rest of the year. After this I’ll be ready for what next year has to offer. From the second week of January I’ll start preparing seriously for the Boston Marathon on 20 April 2015. But don’t get me wrong, I’m still training in December. It’s only that my training is quite relaxed and all of it base training. ie. really slow. The rest days gives my body time to recover and this will help it to respond better to the hard training to follow and reach a better Peak of fitness. It’s like the highest mountains having the biggest bases. The bigger the base the higher you can go. You may train to maintain a healthy weight and aren’t interested in endurance sport. It still wouldn’t hurt you to relax a little in December too, then be really motivated again next year. Keep in mind this doesn’t mean you should go ballistic now, try keep things in check. By all means though, have that glass of wine or even that muffin and skip some training. So maybe I’ll have another muffin before I board the plane, maybe I won’t. I’m not going to feel guilty about whatever I do though. And I’ll be ready for what’s coming next year. Sportfasting-SA would like to congratulate two of the latest clients who have completed the program. Sean Viljoen, a top Veteran cyclist, has just finished the program at 83.5kg from a starting weight of 89.7kg! Fantastic result and he has told us his training rides now feel better than they have in years. 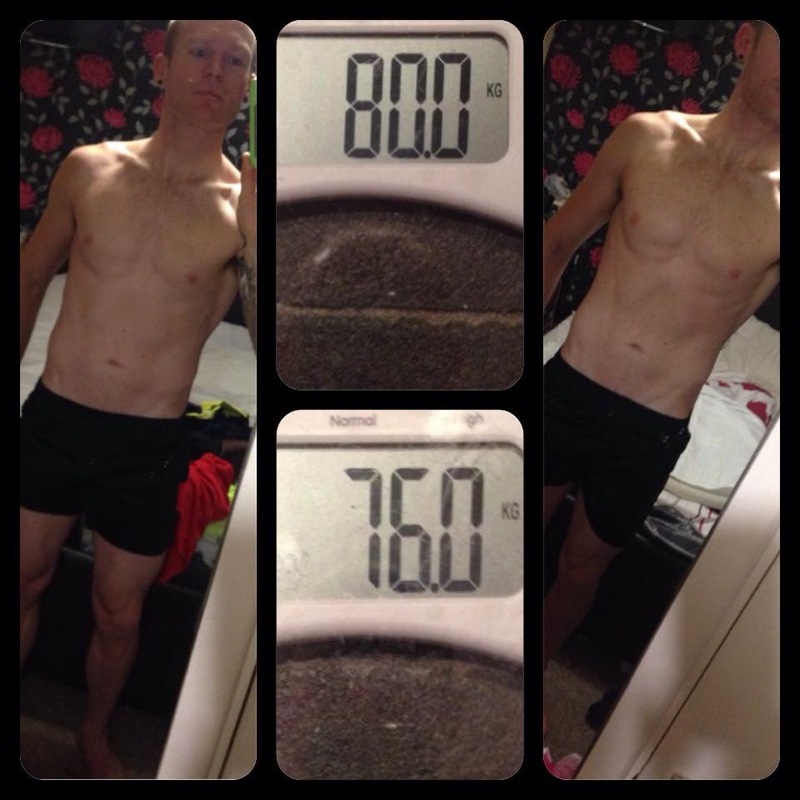 Ulrich Pearce, who has been training hard for the Double Century cycle race coming up on November 21st, decided to do the Sportfasting program to shed a few extra Kg’s and improve his overall fitness. He lost 6kg’s and is now able to push out a higher average wattage on his wattbike at a lower heart rate than he was ever able to previously. Well done to both of you and good luck for the DC ! Not everyone knows what being ‘in the zone’ means. Put simply, it’s when a sportsman is performing their sport, it feels easy and they are doing it well. So if you’re a motocross rider, as Paul my business partner was, you hardly feel the bumps, big jumps seem small, you take corners like you’re on rails and you do it all faster than ever before…while it all feels quite easy. It would be almost trance-like and you would almost certainly wish to do it like that every time. Unfortunately that’s not how it happens. Some people are never ‘in the zone’ and some are there most times. Those are likely to be sportsmen at the top of their game. At one stage Tiger Woods was probably ‘in the zone’ more than most, although he was also in many other places he shouldn’t have been but that’s a story for a different type of e-mail and website. Paul reckons he has been ‘in the zone’ about 10 times while racing motocross. Once was at The British round of The Grand Prix World Motocross Championship. Over the 2 races that day he finished 2nd overall and was leading one of the two races. To quote: “I started well down the field in thick mud and mud was never my favourite. Somehow that day I found passing people quite easy and after 8 laps I was leading. I remember one moment in particular: I had just passed the leader ( keep in mind English fans had adopted Paul as their own as he raced out of England and this was basically his home track). Shortly after that, in mid air over a jump, the fans were cheering so loud I couldn’t hear my own bike…I had a chill. That was a moment I’ll never forget. That day I was in the zone and riding was fun”. While Sportfasting may be great it can’t get you ‘in the zone’…the fat burning zone yes but not ‘in the zone’ described above. The fat burning zone is a great place to start though. You can improve endurance sports performance and lose weight and there’s nothing wrong with that. For those of you who don’t already know, in the August version of GETIT magazine there was an interview with Vaylen Kirtley who amongst other things is a news and sports presenter on SABC. In fact some of you probably subscribed to this list because of the interview. Every weekday morning you will see Vaylen on Morning Live on SABC. Based on the interview clearly Vaylen was happy with Sportfasting. Check it out in the media section of our website by clicking ‘here’. We spoke about Vaylen in our e-mail from 29 April this year. For those who have not been on this mailing list long enough to read about Vaylen the summary is: Last year she did ‘Make the switch’. This year she wanted to do The Two Oceans, the full 56km…being a full time working mom with about 5 hours every week to train. Yah right, no chance. Vaylen asked us if we could help, being happy with the results of ‘Make the switch’. We suggested a series of mini fasts, which are 3 day programs with only 1 complete fasting day. She did The Two Oceans in 5hours 35minutes. Damn fine achievement with so little training. It’s good when anyone using Sportfasting has a marked improvement, be it a customer or even the Sportfasting crew themselves. After doing a series of ‘mini fasts’, Gregg wanted to test himself in his favourite discipline – the 21 km or half marathon. Racing on Sunday 14 September in the Southern SuperSpar Fred Morrison Half Marathon, he ran 83mins 12sec which is 47sec better than his Personal Best. From Paul and the all the guys from Sportfasting-SA.